I just installed a new hard drive on my second laptop, so it has no OS yet. I use the Windows 10 Media Creation Tool to prepare a Lexar 16GB drive for installing Windows 10 x64 on my ASUS ZenBook UX32VD (Intel® Core™ i7 3517U Processor), but although the system BIOS correctly begins the boot procedure from the Lexar USB drive (I've chosen the options in the BIOS settings so it will use the UEFI enabled Lexar drive in accord with this helpful post in the ASUSTeK Computer Inc. Forum), it stops and the screen goes blank after a brief period of hard drive activity following the Windows 10 logo being shown on screen. 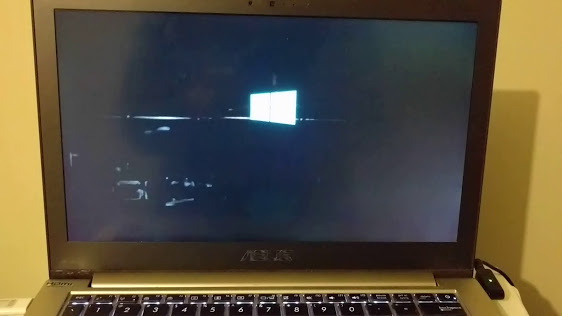 The Lexar drive LED shows that it's being read, the Windows 10 logo shows on the screen, then the spinning loading graphic appears underneath the Windows 10 logo, the screen goes blank while the hard drive is active, then no progress (the screen remains blank). I've used Seagate's SeaTools application to verify that my hard drive is in fact working correctly, and the hard drive passes all test. I've also used the Rufus USB tool in each of the three possible partition schemes without success (same result). My system is running the latest BIOS available for the motherboard and it was running Windows 10 x64 prior to the hard drive swap. I am not sure how to proceed from here, so I am reaching out to the community for assistance. Thank you for any help! That's definitely weird. I have an ASUS ZenBook UX305CA, with Windows 10 Enterprise installed in UEFI mode on GPT partition table. Secure Boot is set to Off in my BIOS and CSM is enabled. Edit: You don't need Rufus to create a USB. It's really simple. Open up a CMD prompt as admin. Omit the quotes when typing the commands. When done just mount the ISO you got from Microsoft and copy the files onto the USB. Microsoft does have an official USB creator tool called Microsoft USB/DVD Download Tool, but it's really old, and it will only create a USB that will install Windows in legacy/CSM/MBR mode. UEFI not supported with that tool. If you don't mind installing in legacy mode, then it will work fine and is simple to use. I have confirmed the setup ISO disc image is not corrupt (MD5 hash matches), I have scanned the USB for any errors and I've also used a different Lexar USB drive with the same result. I've used FAT32 formatting without success. If the ISO isn't corrupt, your USB and HDD are fine, then possibly (unlikely) the HDD is either incompatible with the notebook or has issues with your model. I think maybe posting your BIOS settings might help us help you. Take pictures with a phone/whatever, or just type the info out. Is the drive firmly plugged in? What about your RAM? Try seeing what happens if you boot the USB with the HDD removed. Good suggestion. So when I remove the hard drive entirely, it does exactly the same thing as when the hard drive is in (Windows logo, loading spinner, LED shows hard drive activity, screen goes blank; link to video); and it even does the same thing when the RAM module and hard drive are both removed (however, the BIOS shows 2GB of on-board RAM that cannot be removed). Have I busted my motherboard? Edited by mavaddat, 18 April 2016 - 04:31 AM. I finally figured out how to bypass this incredibly obstinate obstacle: I downloaded Acronis True Image on a pure hunch, booted off it, used it to mirror the Windows install disk onto a partition on my hard drive, then booted off that partition. Microsoft, fix your USB booting capabilities! Glad to see you solved the problem. i had a similar issue to yours awhile back and had to copy the Windows files to a partition then initiate the install from there. I had to do the same thing with Arch Linux because the installer wouldnt boot from the only flash drive i had.USB boot can be a bit flaky depending on OS, hardware, etc. I'm thinking your issue was down to either something not quite being right with the files in your particular ISO, or a bad USB drive. Some hardware can be picky when it comes to USB booting.